Above: All of my essential items fit in a 12-by-24-inch tote. “Going agile” is an optional program for my office. Twenty percent of my colleagues and I elected to be agile workers. This means that we no longer have an assigned seat in the office. Every day we choose between a selection of stations, and they are first come, first served. Each station is configured with the same dual-monitor setup that plugs into our laptops. The stations are intermixed within all of the departments. While similar, each station has slightly different characteristics: some are adjacent to windows, aisles, collaboration spaces, etc. Per policy, one cannot sit in the same station twice per week (in other words, no squatting). Giving up dedicated seating to be agile also means giving up filing cabinets and drawers. 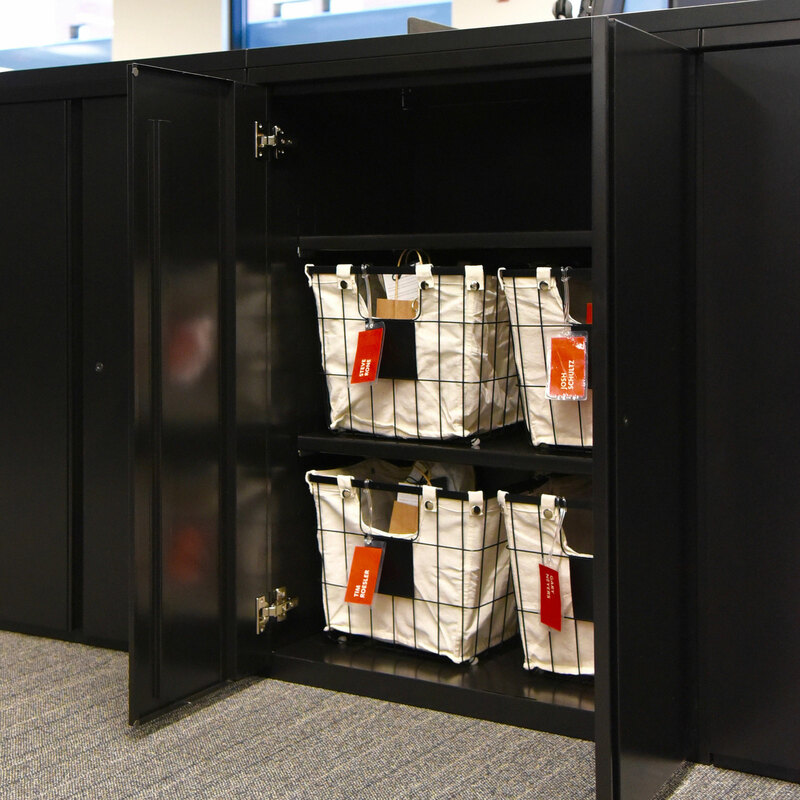 All agile employees have a 12-by-24-inch tote to keep belongings. Think of this as moving into a tiny house — while you have to be selective of what you keep, a minimalist approach can be very freeing. It’s also not for everyone. To downsize to my tote, I digitized my important notes and switched from a landline to a softphone. I got rid of my collection of expired ChapStick, tchotchkes, and used notebooks. I returned my hoard of Post-its, paper clips, and pens to the supply room, transferred my family photo to my desktop background, and rehomed my desk plant. I felt like I was all set for day one. A mix of sit-stand stations and collaboration areas support agile working. Day 1: On my first day of going agile, I immediately regretted it (spoiler alert — it gets better!). It was disorientating stepping foot into our brand-new office, and I had no idea where to go or where my tote had ended up in the move. Once I was able to access a map of our new floor plan, I found a seat for the day and settled in. I had survived my first day as an agile worker. Day 2: Based on the rules, I had to find a new desk. I chose a quiet spot by a window to hunker down and crank out some work. I noticed that I had significantly less interruptions from people stopping over to ask me questions or chat. In our old space, I had sat by the same people for years. We would talk on and off all day and spew off questions to each other. While it was fun, it was also disruptive. Day 3: I found a spot conveniently located between two colleagues who I was in the midst of a project with. We were able to collaborate throughout the day and made significant headway. It was much more effective than trying to schedule multiple meetings in another space. Day 4: I have back-to-back meetings on Thursdays, so instead of claiming a workstation, I worked in the café and soft seating during my sporadic 30-minute breaks. This allowed me to keep up with email and focus on a few key tasks while still being prepared for another meeting to start. Week 2: When a family emergency resulted in me spending a couple weeks away from the office, I realized how well agile working had prepared me to work remotely. All of my important documents were already at my fingertips. With Skype and my softphone, most people didn’t even realize I wasn’t physically in the office. Instead of having to burn through my vacation time, I was able to stay engaged in key projects and connect with my team, while also being present with my family. Month 6: It’s been six months since I elected to be an agile worker, and I’m not looking back. I’ve perfected my morning set-up and afternoon clean-up to less than two minutes. I have seven favorite stations that I rotate between depending upon what’s available, where the sun is shining, and who I need to work with. I also have a greater sense of control over my day and life. All of my essential items fit in a 12-by-24-inch tote. Every day is a fresh start. My morning ritual in the office begins when I choose a vacant station. I unpack my tote and take a few minutes to get situated and prioritize my tasks for the day. I’m more organized now — no more sifting through piles of paper and a growing stack of reading materials that I’ll never get to. My day ends with tossing out papers I no longer need and tucking away my tote for the night. I’m more productive when I can choose my environment. Depending on my workload and mood, I can choose a station that will best support my productivity. I may elect to be heads-down in a quiet area or collaborating with my core team. If my schedule is packed with meetings, I’m prepared to set up in the cafe or the conference room to work between meetings. I can also head to a coffee shop or work from home. However, I’ve found that I prefer coming into the office to complete most of my work. I know my coworkers better. Working at different stations has provided the opportunity to sit within departments that I don’t typically interact with. I’ve learned more about the challenges they face, the successes they celebrate, and have gained new insight on some of my projects. Knowing more people in the office also makes every day more fun. Our agile policy was communicated by leadership from the perspective of choice and empowerment, but it’s also a statement of trust. All employees must understand and respect the system for it to be effective. While agile working has been successful for me, some of my colleagues don’t want to try it. They like the consistency of having their assigned space and more room for their belongings, and that’s okay. "It's been six months since I elected to be an agile worker, and I'm not looking back." Successfully implementing an agile work policy goes beyond the logistics of who sits where and mandating the same approach for everyone. 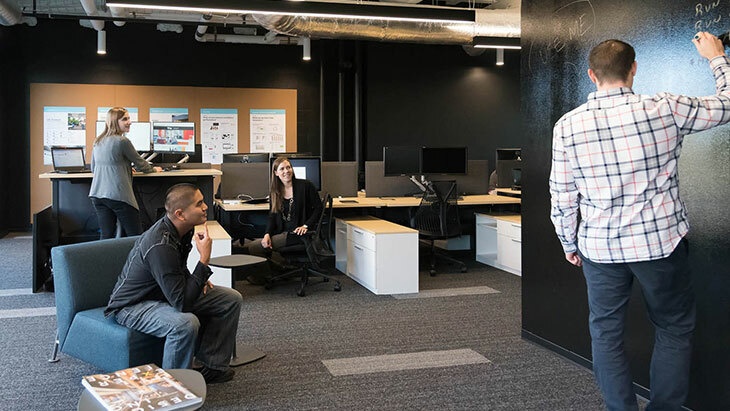 It deserves thoughtful change management to communicate benefits and values to employees and empower everyone to bring their best selves to the office, whether that’s through agile, one-to-one seating, or a mix. I have 30 more years of work ahead of me, and it’s incredibly liberating to know that I’m not mandated to spend it assigned to a 5-by-5-foot space. I’m not sure what this will mean for me yet, but I can envision a lot of interesting opportunities for personal and professional growth now that I’m not tied to a desk. Would you volunteer to try agile working?